Now that the Nonprofit Starter Pack 3.0 has made its official debut, a lot of organizations that are on the are wondering, “Should we make the switch?” The answer to that question will depend on the customizations your organization has made to your Salesforce instance. For new implementations NPSP 3.0 is the way to go, no question. The folks at The Salesforce Foundation have done a bang up job consolidating code, establishing a common installer, creating a slick new admin interface, and building out some indispensable functionality. The downside to all these new features is that they’ve come a little late for many nonprofits. Organizations have built out their own customizations to achieve some of the mission critical functionality included in NPSP 3.0. Ultimately, organizations will have to decide if it’s worth moving away from what they’ve built in favor of the supported functionality of the NPSP. In most cases it’s probably worth planning a migration at some point in the not too distant future. So, what exactly is included in NPSP 3.0 that’s so great? Let’s take a look at three features that are real game changers. Address verification is one of the most talked about inclusions in 3.0. Good addresses are worth their weight in gold (how much does an address weigh anyway?). For-profit organizations spend a great deal of time and effort ensuring their mailing lists are current. Accurate data is just as important to nonprofits, but they don’t have nearly the resources to dedicate to this task. NPSP 3.0 includes a built in API connection to a variety of address verification services, including Smarty Streets. Some of the features these services offer include: standardization of addresses, matching of city, state, and zip code, auto-completion when entering a new address, and address extraction from text such as emails and articles. No longer do contacts need to have an account and a household. They’re now one and the same. Used in conjunction with the new Primary Affiliation designation to record employment, the household account model intuitively makes more sense for many nonprofits based on how they interact with constituents. Not to mention the reduction in complexity of data entry! 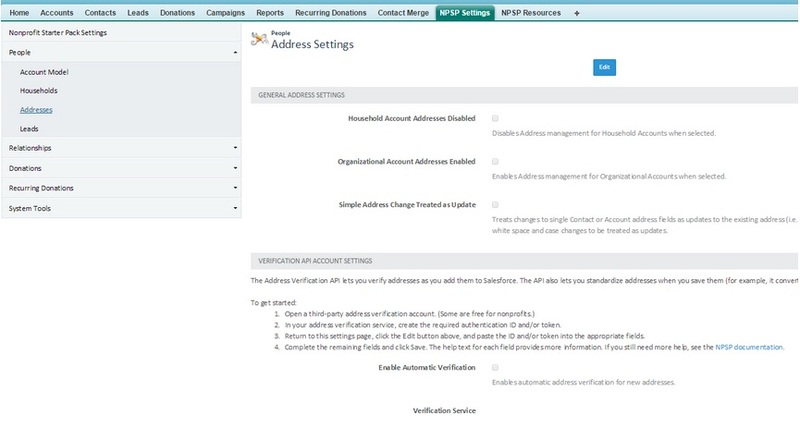 The Foundation has included an account conversion utility to reduce the headache of migrating to the new household account model. You can read more about the utility here: NPSP 3.0 Account Conversion However, even with the conversion utility organizations still have their work cut out for them. Allocations are a fantastic new addition, if you haven’t already built out your own fund object. Allocations allow donations to be counted toward specific funds. Read more here. This is essential functionality to a lot of nonprofits and most of them have built their own fund tracking as a result. For organizations that are new to Salesforce though, donation allocations will be a welcome addition! Bottom line? NPSP 3.0 is great for new implementations, but can be frustrating for organizations with existing implementations. If your organization has built out any of the functionality included in 3.0 you’ll have to do some research to decide if migrating your data will be worth it. Although Salesforce has not announced any plans to stop supporting earlier versions of the NPSP, any new features down the road will require 3.0. Eventually it will be worth it to make the switch, it’s just a question of how and when.